Los Angeles County -- as well as the rest of the country -- is seeing an unusually high rate of influenza-like illnesses. We are experiencing higher rates than last year, and we are having an especially robust number of illnesses due to influenza B. We continue to see endemic levels of RSV, especially in pediatric patients. The Joint Commission has revised its Accreditation Participation Requirement (APR) 17 to emphasize the inclusion of medical staff and physicians in this requirement. The FDA has informed healthcare professionals and patients that it has sent letters warning seven pharmacy companies that the claims they make about the safety and effectiveness of their so-called "bio-identical hormone replacement therapy," or "BHRT" products, are unsupported by medical evidence, and are considered false and misleading. 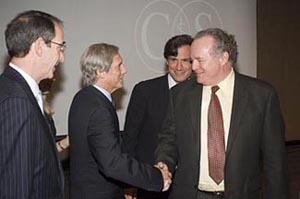 Steven Piantadosi, M.D., (far right) is congratulated by (l-r) Mark S. Siegel, chair of Cedars-Sinai's Board of Directors; Ed Sachse, co-chair of Phase ONE Foundation, and Steve Romick, board member of Phase ONE Foundation. Steven Piantadosi, M.D., director of Cedars-Sinai's Samuel Oschin Comprehensive Cancer Institute, was named the inaugural Phase ONE Foundation Chairholder at the medical center on February 6. Physicians can now access information on patients treated by the Procedure Center in just minutes, thanks to a new electronic database that became operational in January. Physicians can click here for a PDF list of new books and journals added to the collection of the Medical Library. Those marked MAIN BOOK or NEW BOOK are available for check-out. You can search for test results by test name, test code, or any part of a test name or test code. If the test is ordered as part of a battery or by itself, it will be found. The right hand column titled "Part of" shows what panel or battery the test belongs to, if appropriate. 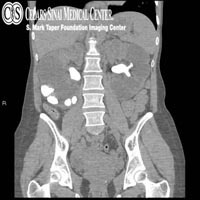 40-year-old female with one-day history of right flank pain and vomiting. The Attending Staff Gomers will take on last year's winning team, the Housestaff Blues, on Sunday, May 18 at Cedars-Sinai's 6th annual physician basketball game, held at Beverly Hills High School. Won any awards or had an article accepted for publication? Share your news about professional achievements and other items of interest by clicking on the link below to e-mail the Chief of Staff's office. © Copyright 2000-2019 Cedars-Sinai Health System.